Have I mentioned I love my crock-pot? I have an older model Rival of smallish capacity that I got 20+ years ago as a wedding gift. I've always used it for beans and soup, but in the last few years, as our schedules have gotten crazier and my kids' appetites bigger, I've been explored several new (and most of them delicious) recipes that have become family favorites. This only takes about 5 hours so I don't do it on days when I'm gone ALL day, but it's still worth it to come home from an afternoon of shopping and have creamy mac-n-cheese almost ready. Results can vary depending on what sort of slow-cooker/crock pot you have, it pays to try this once while you ARE home to see how it turns out. Pour into crockpot. Rinse blender with 2 1/2 cups water and add to cooker. 1 1/2 cup uncooked macaroni, and 1/2 cup shredded vegan cheeze, and stir. Do this and re-cover as quickly as possible so it retains the heat. Cook on high for 40 more minutes (perfect time for while you make the rest of supper). Mac & Cheeze in a crock pot! What a great idea. oh my, this sounds sooo good. how would you recommend cooking the mac if we don't have a crockpot? This is a prime example of why I LOVE your recipes! oh wow, this is beautiful and tasty sounding! Julie, if you don't have a slow cooker, I would recommend another vegan mac-n-cheese recipe. 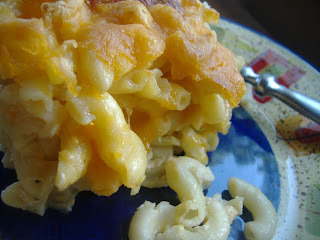 Wow, I actually have not craved mac n cheese once since going vegan until seeing that photo. Mmmm.. can't wait for lunchtime! vegan crock-pot recipes, YES!! keep them coming!! does being vegan get any better? what kind of vegan cheese do you recommend? Well I can't find pimientos OR Umeboshi vinegar in Australia ... any ideas for substitutes? Can I use any vinegar? I don't know why it's so hard to find pimientos here, but I have not yet found them. I suppose I could just cut up bell peppers? For the pimentos, try jarred roasted red peppers packed in oil or brine (not vinegar) The redness helps the cheese look orange-y and the peppers do add something... raw peppers would be interesting... I suppose as a last resort? But just a tiny bit is needed. I do not have a crockpot can I put it at a low temp in my oven? ?